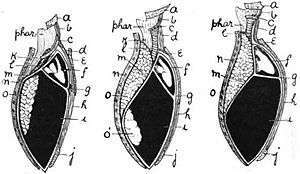 In human anatomy, the thoracic diaphragm, or simply the diaphragm (Ancient Greek: διάφραγμα diáphragma "partition"), is a sheet of internal skeletal muscle that extends across the bottom of the thoracic cavity. The diaphragm separates the thoracic cavity, containing the heart and lungs, from the abdominal cavity and performs an important function in respiration: as the diaphragm contracts, the volume of the thoracic cavity increases and air is drawn into the lungs. 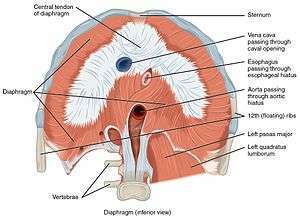 The term diaphragm in anatomy can refer to other flat structures such as the urogenital diaphragm or pelvic diaphragm, but "the diaphragm" generally refers to the thoracic diaphragm. In humans, the diaphragm is slightly asymmetric—its right half is higher up (superior) to the left half, since the large liver rests beneath the right half of the diaphragm. The diaphragm is a dome-shaped structure of muscle and fibrous tissue that separates the thoracic cavity from the abdomen. The dome curves upwards. The superior surface of the dome forms the floor of the thoracic cavity, and the inferior surface the roof of the abdominal cavity. The muscle fibres of the diaphragm emerge from many surrounding structures. At the front, fibres insert into the xiphoid process and along the costal margin. Laterally, muscle fibers insert into ribs 6-12. In the back, muscle fibres insert into the vertebra at T12 and two appendages, the right and left crus, descend and insert into the lumbar vertebrae at L1 & L2. Aortic Hiatus (12 letters) – "Passes" through the diaphragm at T12. Table documenting openings through the diaphragm and their contents. 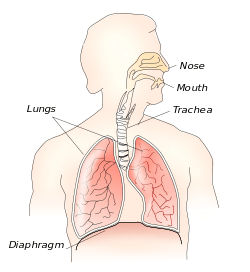 The diaphragm functions in breathing. During inhalation, the diaphragm contracts and moves in the inferior direction, thus enlarging the volume of the thoracic cavity (the external intercostal muscles also participate in this enlargement). This reduces intra-thoracic pressure: In other words, enlarging the cavity creates suction that draws air into the lungs. When the diaphragm relaxes, air is exhaled by elastic recoil of the lung and the tissues lining the thoracic cavity. Assisting this function with muscular effort (called forced exhalation) involves the internal intercostal muscles used in conjunction with the abdominal muscles, which act as an antagonist paired with the diaphragm's contraction. If either the phrenic nerve, cervical spine or brainstem is damaged, this will sever the nervous supply to the diaphragm. The most common damage to the phrenic nerve is by bronchial cancer, which usually only affects one side of the diaphragm. Other causes include Guillain–Barré syndrome and systemic lupus erythematosis. A hiatus hernia is a hernia common in adults in which parts of the lower esophagus or stomach that are normally in the abdomen pass bulge abnormally through the diaphragm and are present in the thorax. Hernias are described as rolling, in which the hernia is beside the oesophagus, or sliding, in which the hernia directly involves the esophagus. 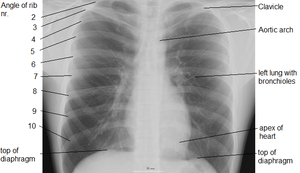 These hernias are implicated in the development of reflux, as the different pressures between the thorax and abdomen normally act to keep pressure on the esophageal hiatus. With herniation, this pressure is no longer present, and the angle between the cardia of the stomach and the oesophagus disappear. Not all hiatus hernias cause symptoms however, although almost all people with Barrett's oesophagus or oesophagitis have a hiatus hernia. Peritoneopericardial diaphragmatic hernia in a cat. 1 2 3 4 5 6 7 8 9 Drake, Richard L.; Vogl, Wayne; Tibbitts, Adam W.M. Mitchell; illustrations by Richard; Richardson, Paul (2005). Gray's anatomy for students. Philadelphia: Elsevier/Churchill Livingstone. pp. 134–135. ISBN 978-0-8089-2306-0. ↑ Moore, Keith (2014). Clinically Oriented Anatomy (7 ed.). Baltimore: Walters Kluwer. p. 306. 1 2 Hay, William W., ed. (2011). Current diagnosis & treatment : pediatrics (20th ed.). New York: McGraw-Hill Medical. p. 602. ISBN 978-0-07-166444-8. 1 2 Arthur Keith, M.D. (1905). The nature of the mammalian diaphragm and pleural cavities. Journal of Anatomy and Physiology. ↑ Zbynek Kozmik (1999). "Characterization of an amphioxus paired box gene, AmphiPax2/5/8" (PDF). Development. 126 (6): 1295–1304. PMID 10021347. ↑ T. J. Uriona (2005). "Structure and function of the esophagus of the American alligator (Alligator mississippiensis)". Journal of Experimental Biology. 208 (Pt 16): 3047–3053. doi:10.1242/jeb.01746. PMID 16081603.